Four years have passed since we last heard from Icelandic singer-songwriter, actress and fashionista, Björk, whose last effort, 'Volta', was released in 2007. She will follow it up with her seventh LP in a eighteen-year-long solo career (the pixie-faced singer was once in The Sugarcubes), expected later this year. Always in synch with, if ahead of her times, Björk "partly recorded" this anticipated new album, entitled 'Biophilia', on an iPad, and she describes the project (directed by long-time collaborator Michel Gondry) as "encompassing music, apps, internet, installations and live shows". She will showcase this new multimedia adventure at the Manchester International Festival (30th June-17th July) during a residency which will see her perform on 30th June, 3rd, 7th, 10th, 13th and 16th July, with performances scheduled at 4pm and 8.30pm, depending on the date. The performances will feature a number of bespoke, specially-conceived instruments, including a digitally-controlled pipe organ, a gamelan-celeste hybrid, a pin barrel harp and a 30 foot pendulum, which will use the earth's gravitational pull to create sounds. 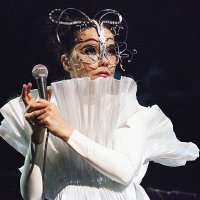 Manchester International Festival director, Alex Poots, says: "it's an honour to be working with Björk to help her premiere these ambitious live shows and we look forward to taking this residency to key cities around the world', so anyone not able to attend in Manchester can relax and watch this space for future Björk announcements. Tickets for the Biophilia premiere at MIF are on sale now and cost £45 + booking fee.